Hot Springs, Ark. 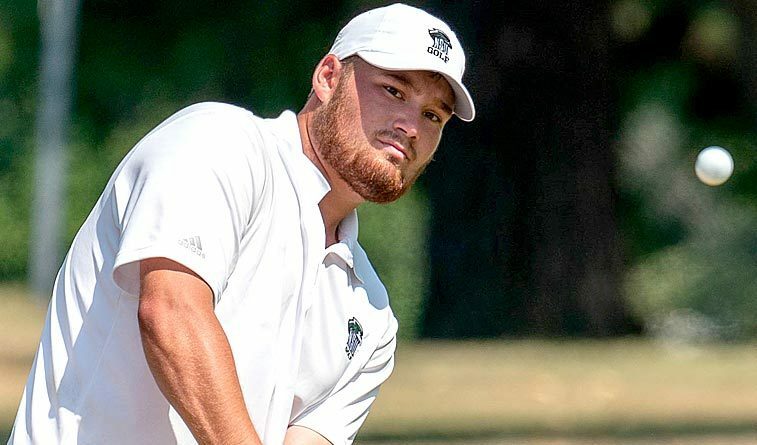 – Southwestern Oklahoma State finished fifth at the Battle of the Belt event in Hot Springs to earn its third Top 10 finish of the season. Host Henderson State won the 17-team tourney at 849, followed by Southern Arkansas (860), Central Missouri (865), Maryville (866) and Southwestern Oklahoma (867). Gustavo Tineo led the Bulldogs in all three days of the event, turning in under par scores each day including a 2-under par 70 on the final day placing him seventh at -4 for the tournament. Gregor Weck shot 74 to put him at 2-over and tied for 28th. The Bulldogs will return to the course to wrap up their fall season at the Central Regional Invitational on October 8-9 in St. Joseph, MO. Holden Crago fired a two-under-par 70 to pace Central Oklahoma. The Bronchos closed with a 1-under 287 to finish in a tie for seventh with an 872 total in the three-day, 54-hole event at the 6,713-yard, par-72 Hot Springs Country Club. Blake Murray and Joe Lemieux backed Crago’s 70 with even-par 72s. Yannic Oppenheimer added a 73, while Alexander Hughes had a 77. Peyton Knell shot 73 competing as an individual medalist. Crago tied for eighth in the medalist standings with a three-under 213 total. He made 14 birdies in the tournament. Murray played the par-5s in seven-under in finishing at one-under 215 to tie for 14th. UCO continues its fall season Oct. 15-16 at the Blue Tiger Invitational in Jefferson City, Mo. Northeastern State slid two spots on the leader board and finished ninth with an 875 (289-293-293). Tahlequah native Jax Johnson shot the RiverHawks’ low score at the tournament carding a 216 (73-67-76) and was tied for 21st overall. Carlos Gomez had NSU’s low round with a 69 to match his first day score and was tied for 23rd shooting a 217. Tyler Ashman had a 221 (71-77-73) and Hunter Pennington shot a 227 (76-76-75). Grant Hynes carded a 229 (77-73-79) to round out NSU’s group. The RiverHawks will be back in action next on Oct. 8-9 to play in the Missouri Western State Invitational.